¶ 3 Leave a comment on paragraph 3 0 Despite desires for the post office to be self-sustaining, postal operations and activities from the earliest days required some government funding. Lawmakers and federal officials at all ranks believed that facilitating a system of open and inexpensive communications was critical to supporting a sprawling nation. In the US, operating an accessible, reliable, and affordable postal system was akin to maintaining a public utility. The postal revolution in the 1840s, born out of the needs of an empire, gave birth to stamps–some that actually celebrated empire. With pre-paid postage based on weight, rather than distance traveled, communicating across miles remained inexpensive, and the post office shaped American life as it facilitated the interconnectness of people across the country and the world. The need for accessible and inexpensive communications remains in the digital age. As other federal agencies consider regulations that threaten that affordability, we as citizens need to be active defenders of values that the postal service promotes and maintains today. We must not forget that the federal government subsidized the communication and the circulation of ideas from the earliest days of the nation. ¶ 4 Leave a comment on paragraph 4 0 The post office’s influence on our daily lives has diminished and stamps do not serve the same functional role they once did, because of the ubiquity of electronic communications. Fewer letters are mailed requiring fewer stamps, and more bills are paid online than through paper remittance. Most mail delivered to our boxes contains indicia and not colorful stamps. Even with this reduction in mail volume, the USPS prints nearly twenty-five commemorative stamps each year.2 Other than holiday-themed stamps affixed to holiday cards, most Americans no longer see stamp imagery of new commemoratives or definitive stamps on their mail, and they don’t read about new issues in their daily newspaper. Stamps’ power to naturalize historical narratives is changing in the digital era. 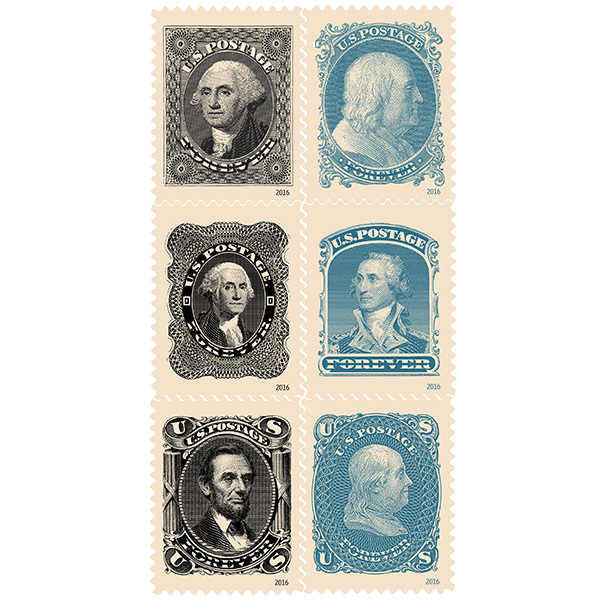 ¶ 5 Leave a comment on paragraph 5 0 While Americans are not seeing stamps as regularly as they once did, interest in stamps and collecting is not dead, and the cultural legacy of stamps lives on in various ways. Federal and private institutions of public memory dedicated to interpreting postal operations, stamps, and mailable matter, such as the Smithsonian’s National Postal Museum in Washington, DC curate multiple galleries as a joint venture of the USPS and the Smithsonian Institution. University museums are rediscovering their stamp collections by mounting exhibitions to focus on the meanings and designs of stamps. In 2012, University of North Carolina, Charolotte’s Africana Studies Department developed Blacks on Stamps and a museum studies graduate course at Brown University’ curated Thousands of Little Colored Windows at the Jay Hay Library. Visitors to these exhibits are encouraged to look closely and read stamps like documents containing symbols and meaning within each design. Each stamp tells a story.3The reach of commemoratives and definitive stamps may not be the same as in the early twentieth century, but stamps live on in collections kept privately and in museums. ¶ 6 Leave a comment on paragraph 6 0 Screenshot of Pinterest.com boards including suggestions for art and craft projects using stamp collections. ¶ 7 Leave a comment on paragraph 7 0 In many ways, the Web reinvigorated stamp collecting for philatelists and enthusiasts. Early stamp collectors joined clubs or purchased philatelic publications to find collectors with similar interests to share, buy, and trade stamps. Since the late 1990s, many collectors trade and sell stamps on auction sites like eBay, and some create websites to share their personal collections, such as Justine’s Stamps or to create resources for others identifying stamps, such as 1847USA. Collectors can easily communicate with one another in online forums, email groups, and meetups. And followers of the National Postal Museum on social media will see stamps and facts related to the images on each stamp in their stream. 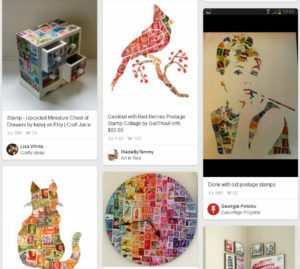 Finding, researching, organizing, and discussing stamps has never been easier.4 Using collected stamps to create art or to decorate furniture, in ways that appeared in the pages of Ladies’ Home Journal in the early 1900s, is also popular. Examples of stamp art can easily be found on Etsy and Pinterest. 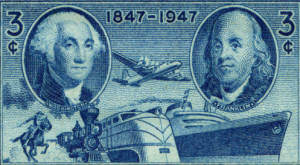 Even the National Postal Museum organizes philatelic art project days. ¶ 9 Leave a comment on paragraph 9 0 When rare stamps appear on an auction block, such as the Inverted Jenny, stamp collecting receives a blip of news coverage, but most stamp collecting activities continue daily. Philatelist hunt online and continue pursuing their favorite kind of stamps. Conversations and debates about current commemoratives appear less often, but interest in stamps printed in the past remains strong. 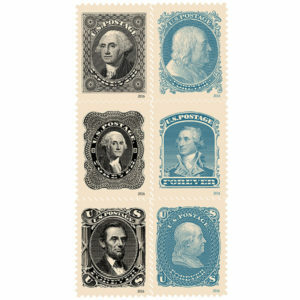 Newly printed stamps are even honoring classic stamps from another era. ¶ 10 Leave a comment on paragraph 10 0 By collecting something originally designed to be functional, stamp collectors influenced postal authorities who printed commemorative stamps and promoted the philatelic hobby. By devoting space to studying collecting practices, I encourage others to look more seriously at collectors and collecting practices to gain a greater appreciation of the history work performed by them. Objects collected and saved by individuals often land in museum collections that be incorporated into exhibitions. Collectors have often been looked upon as quirky people obsessed with the minutiae of the things they collect. They are not always invited to share their expertise with museum staff, but this trend is changing. Some museums embrace collectors and other subject enthusiasts as valuable experts with specialized knowledge who can help interpret the material culture found in artifact rooms. Web platforms that facilitate sharing and co-creation of knowledge encourage historians and curators to invite others to share in the processes of saving and interpreting their own history, or to crowdsource descriptions of digitized objects and records posted online. If historians and museum professionals can see collectors as history workers with a history of their own, then this type of collaboration ushered in by the web may seem less radical.